Staff from the Rec Centre will join us at Kids Love Peace with some super fun activities for the kids. We might get the chance to play with the big parachute! 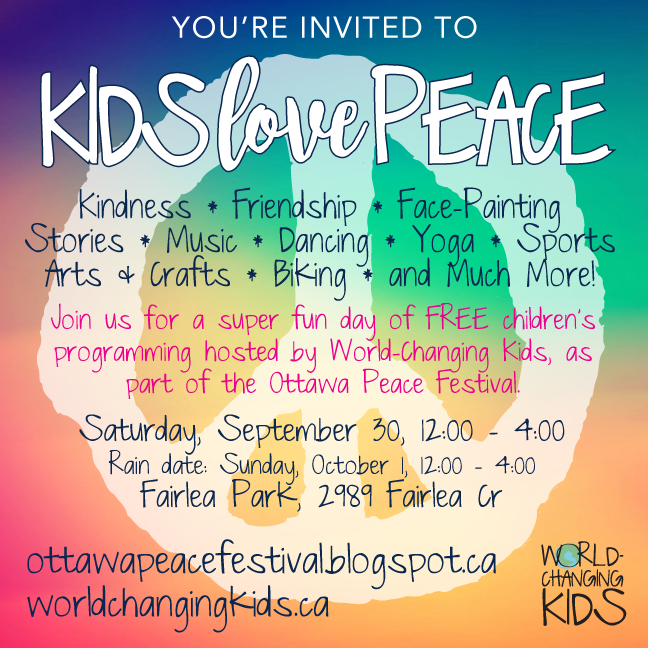 Our awesome friends at Arts Express Ottawa will be joining us at Kids Love Peace and running some fantastic art activities for the kids. Becca will be hosting three music cirlces – one at 1:00, 2:00 and 3:00. If you have not heard Becca’s beautiful music yet, you really need to visit her website to learn more about Becca and take a listen to some of her songs. Building Better Revitalized Neighbourhoods (BBRN) is an initiative of the City of Ottawa to help the community continue to grow as a place where children, youth and adults can meet their everyday needs, participate in community life and succeed! The BBRN initiative involves creating and implementing tailored revitalization plans that leverage community assets to build on what is important to residents now and in the future. Revitalization can include new and existing program and service initiatives, infrastructure projects and redevelopment opportunities. City staff will have a booth set up at Kids Love Peace to share information with residents about this initiative. They will also have a super fun scavenger hunt set up for the kids! Our good friends from FHF will be joining us at Kids Love Peace again this year. They will be bringing music and dancing and arts and crafts and games. Our friends from the Humans for Peace Institution will be joining us at Kids Love Peace. If you have not visited their Facebook page to see the great work that they do, you really should do that now! Join the Ottawa Public Library for some great reading and storytelling activities. Our friends from YOCISO will be joining us at Kids Love Peace. They will be bringing some volunteers to help with all the fun activities and they will have some information to shared about the awesome services and programs that they run.